If you are contemplating a roof replacement or building a new addition to your West Linn area home, West Coast can help you with all aspects of your West Linn re-roof needs. 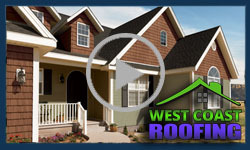 West Coast Roofing specializes in West Linn re-roof projects. We can expertly re-roof your home and replace your old or damaged West Linn-area roof with a top quality structure that will protect your home for years to come. Our highly experienced re-roof experts will provide you with a safe and beautiful new roof that will add value to your West Linn-area home. When you choose West Coast Roofing as your West Linn re-roof expert, you can trust us to give you a complete evaluation of the roof on your West Linn home. We’ll explain all of your options and work with you to develop a re-roofing plan that is best for your particular situation. You can count on West Coast Roofing to help you determine the best roofing material for your home in West Linn. We use nothing but the best materials for our West Linn re-roof projects including top-rated shingles, tile, cedar shakes, natural slate and more. West Linn re-roof projects are often coupled with other construction work like a building addition. West Coast Roofing will work with your other West Linn contractors to minimize the intrusion on your family during the construction process and deliver a quality and timely re-roofing outcome for you and your West Linn area home. We also have experience with West Linn zoning laws, and you can expect us to handle all of the building permit requirements and ensure compliance with any homeowners association rules and guidelines that might apply to your West Linn re-roof project. Are you looking for the best contractor to help you re-roof your West Linn area home? Contact West Coast Roofing today to discuss your West Linn re-roof project!